This stacking chair was the first chair to be made of a single piece of material. The deceptively simple form belies the complexity of the cantilevered structure and the technical requirements of making the chair. Although Verner Panton designed the chair as early as 1960, it was not until later that suitable materials and techniques were available that could be used to make it. This example dates from the first period of mass production, when the chair was made in rigid polyurethane foam cast in a mould. The long and costly production technologies as well as the still unavoidable post-production were reason to change the material to injection moulded polystyrene. But neither material was satisfactory. Only since 1999, Vitra manufactures an injection moulded polypropylene version which seems to be characterised by the right combination of flexibility, durability and lightness. This fourth, authorised version of the chair succeeded for the first time one of Panton’s key goals: being an affordable product. Single piece moulded fibre-glass reinforced polyester chair with continuous serpentine shape forming back, cantilevered seat and base. Together with a remarkable thinness of the material in parts, the unbroken S-curve offers stackability. The lower section beneath the seat arches backward in a curve which provides space for the sitter’s legs and feet and offers stability to the base. Except for the base, all edges are strengthened by curving the polyester underneath, most evidently at the corner between seat and base. The whole chair has an orange paint which presents a glossy appearance. During his studies (around 1950), Verner Panton experimented with chairs constructed from a single piece of material. 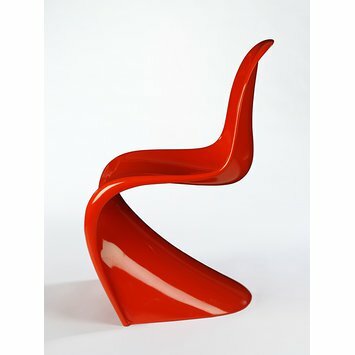 By 1956 he had designed the S-chair made of moulded laminated wood and featuring an unbroken S- curve. The Sommer company manufactured this chair and Thonet marketed it in two different model versions (models 275 and 276). These chairs can be called the first cantilevered chairs made from a single piece of material. However, the moulded plywood S-chair could only be produced in very small series as it was extremely expensive. In addition, new plastics seemed to offer a so far unknown freedom of form. Fascinated by the material, Panton started modifying the S-chair, most crucially by providing comfortable leg room with a cantilevered base. In 1960, he developed the first model of the chair using extruded polystyron manufactured by Dansk Acryl Teknik. This prototype still needed design development and was not a full scale version of a chair ready for manufacture; it served Panton in his search to find a manufacturer. In 1963, he met Willi Fehlbaum, the owners of Vitra who manufactured the Herman Miller Collection under license. But despite Fehlbaum’s enthusiasm the American colleagues were sceptical. Georg Nelson, head designer of Miller, supposedly said that the design is for a sculpture not a chair. (Remmele 2000: 78) After years of experimenting, the first (about ten) hand –laminated, fibreglass-reinforced polyester prototypes appeared between 1965 and 1967 made by Herman Miller/Vitra. On the basis of those prototypes the design of the Panton chair was finalised in accordance with the possibilities of the material and needs of the production process. In 1967, a small series of 100 to 150 chairs were made using cold-pressed, fibreglass-reinvorced polyester. However, the production of the chair was still complicated, expensive and involved manual labour. The chair also had a considerable weight, uneven finish and due to its production a high price. One problem was to reduce the thickness of the material without forfeiting stability to make the chair stackable. Baydur, high resistance polyurethane foam from Bayer seemed to provide the solution. With support from Bayer the final version went into serial production in 1968 under the label of Herman Miller Furniture Co. This aesthetically improved (sleek lines, finely modelled edges, varying thickness of shell, smooth and shiny surface) version was varnished in seven colours. Nevertheless, due to the new moulding process the production of larger numbers was now possible but the manual post-production (polishing, priming and varnishing) was still unavoidable. Hence, Vitra together with Verner Panton continued working on perfecting the process. The new thermoplastic polystyrene from BASF, named ‘Luran S’ promised better material qualities and an easier production process (injection moulding). The chair was made from pre-dyed plastic granules and needed no further work after moulding. The previous costly production technology – 30 minutes were required to produce one piece – was replaced with injection moulding. However, some formal modifications were necessary as injection moulding only allowed a continuous wall size (thickness). The edge profile had to be strengthened and reinforcing ribs placed underneath the seat. 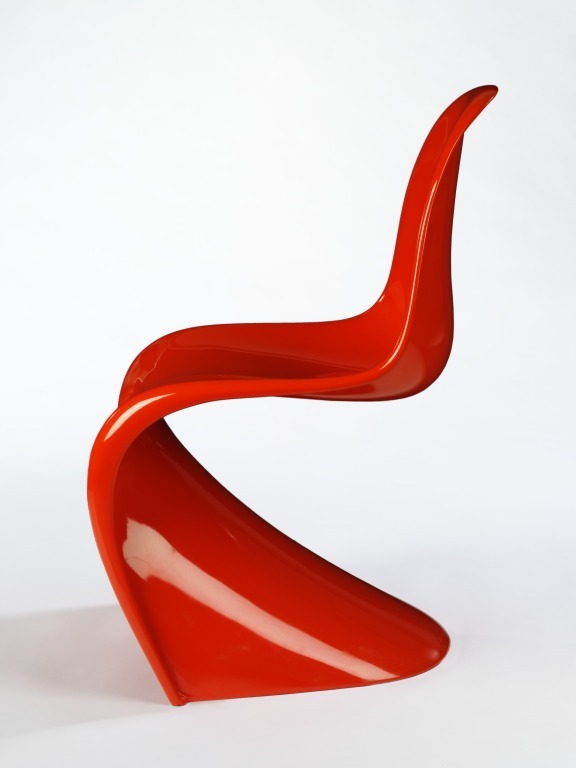 This third version (Luran S version) of the Panton chair was produced between 1971 and 1979. In the long run, however, this material ‘Luran S’ did not withstand dynamic stress and breaking of chairs was reported due to the aging properties of the material since 1974. Vitra discontinued production in 1979 after damaging complaints about the quality. Herman Miller produced the chair for the US only between 1973 and 1975. The licence was returned to Panton who started to look for another manufacturer again. In 1983, Horn GmbH & Co KG in Rudersberg began producing the chair in polyurethane hard-foam (HR foam) again and sold it via the WK association (Neue Gemeinschaft fuer Wohnkultur) until the end of the eighties. This foam version is very similar to the one produced between 1968 and 1971, but the signature of Verner Panton on the back of the trail is the apparent sign for this production run (Signing started in 1983, see Verner Panton, Das Gesamtwerk. Vitra, 2000, p.90 or Verner Panton. The collected Works. Vitra, 2000, p.85). Since 1990, Vitra is producing the chair again in HR foam. In 1999, injection moulded polypropylene was employed due to technical improvements in processing plastics, which seemed to offer the right mixture of flexibility, durability and lightness. This fourth, authorised version of the chair – which is in production parallel to the foam version - succeeded for the first time one of the key goals of the designer: to become an affordable product. With regard to the production process as well as its form this version is similar to the 1971-79 version. The main difference is a matt surface due to the soft material which is vulnerable to scratches. Verner Panton is one of the most important post-war designers. He was born in Denmark but moved to Switzerland in the 1960s where he lived most of his life. He could be labelled as the most influential 1960s designer who introduced pop to furniture and interior design. He was dedicated to the use of colours and plastics as material for furniture. With the latter, he broke with the Scandinavian tradition of producing handcrafted teak wood furniture. He had studied with lighting designer Paul Henningsen and worked for the architect Arne Jacobsen; both were of vital influence. Chair was bought directly from Herman Miller UK. KAISER, Niels-Jørgen: Verner Panton (Copenhagen, n.d. These are probably the first single-piece chairs to be made using an injection moulding process. This chair is cast in a single piece. It was designed in 1960, but mass production only became possible in 1968. Polyurethane foam was cast in a mould, then polished, primed and painted.